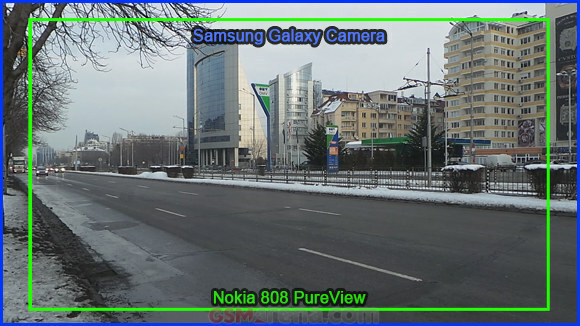 The Samsung Galaxy Camera shoots 1080p videos at 17Mbps bitrate, which should compensate for the slightly wider field of view compared to the Nokia 808 PureView whose videos are shot at 14-16Mbps on average (though they can get as high as 20Mbps, depending on the scene). That's what you would expect anyway. Here's the difference in the field of view of both cameras. First up is a video shot in good lighting conditions on a tripod. We'll be looking into image stabilization and low-light performance later on. 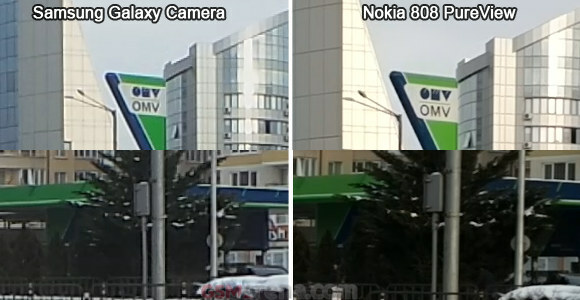 The videos shot with the 808 PureView have more detail in them, however, things that are discernible in its clips get smeared away by the Galaxy Camera. You can see it clearly in the lower half of the 100% crops below, the thinest branches are a lot sharper in the 808 video. The Galaxy Camera applies strong sharpening (as evident by the halos), but that doesn't help it. As far as dynamic range goes, both cameras are about equal. The Samsung Galaxy Camera actually seems to have a slight advantage in this department, but it produces videos with low contrast. The Nokia 808 PureView makes full use of the range offered by the video codec, while Galaxy Camera videos look a bit flat. There's not a lot to be said about the framerate of the videos - both can shoot 1080p videos at 30fps and the results are as smooth as 30fps gets. The 808 PureView has additional options of 24fps and 25fps, which might appeal to film buffs. Still, after seeing the 720p@60fps mode on the Galaxy Camera, even good 30fps videos look a little choppy. The PureView doesn't have such a mode, so we can't compare the two. 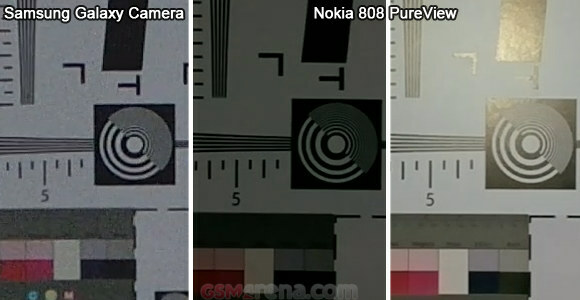 As far as white balance is concerned, the Nokia 808 PureView gets fairly accurate results but it errs on the yellow side. The Samsung Galaxy Camera does what it did in the still camera mode - slight saturation boost and a cooler white balance. If you prefer to do your own crops, you can grab a short sample from the Samsung Galaxy Camera (0:09s, 18.8MB) and from the Nokia 808 PureView (0:08s, 9.8MB). The Samsung Galaxy Camera still has a couple of tricks up its sleeve though. 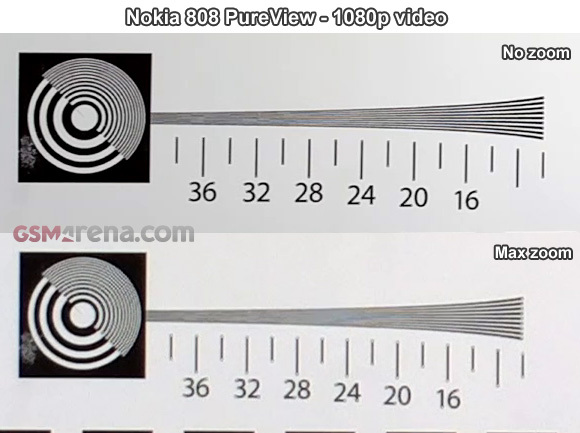 The first is Optical Image Stabilization (OIS) over the Nokia 808 PureView's digital stabilization. We put the two devices together and shot a video to compare how well each approach works. Having a proper optical stabilization makes a world of difference. It's especially noticeable when you're trying to hold still - the 808 videos look jittery, while the Galaxy Camera video is very stable, with only a slight wobble. The effects of stabilization are also visible during panning though they are slightly less pronounced. The Galaxy Camera even manages to correct relatively heavy shaking, which looks pretty bad on the Nokia. The second advantage is the zoom - you get the full 21x zoom while shooting video with the Galaxy Camera and thanks to the OIS you get good videos too (without it the shake would be magnified proportionally to the zoom, rendering the video unusable). A cool feature is the Quiet zoom mode, which makes sure that none of the noise coming from the lens motor as it moves is recorded on video. But the Nokia 808 PureView can zoom too - maybe not 21x, but 4x (at 1080p, 6x at 720p) is still pretty good. And just as with the still image, the zoom is "lossless". The quality does degrade, but that's only because when you zoom in, the camera has to give up on the super sampling. Here's how much is lost - we shot a video without zoom and then stepped back and zoomed in to 4x so that the chart would appear the same size. Oh, and this zoom is quiet too - there are no moving parts to make any noise. One thing we should note here is that Samsung Galaxy Camera doesn't have touch focus and you can't turn Continuous autofocus off (which can get a bit overzealous and cause constant refocusing). The Nokia 808 PureView has both touch focus (even during recording) and an option to switch Continuous autofocus off. 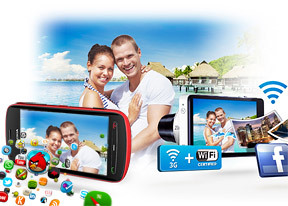 Audio is captured in stereo at 128 Kbps bitrate and 48 kHz sampling rate for the Galaxy Camera and 256Kbps and 48kHz sampling for the 808 PureView. The Nokia is boasting special mics that should allow it to record sound as loud as 140dB without distortion, which gives it an edge though. If we had to take one of those to a concert, we'd certainly side with the Nokia. The Samsung Galaxy Camera won back some points when it came to low-light still photography, so we decided to check it does in the dark when shooting videos too. The xenon flash is of no help here and it's the only flash that the Camera has. The 808 PureView has a video light LED, which while not too strong and useless for objects located too far can help for up close shots. Note: videos were shot at 1.2 m / 4 feet from the chart. 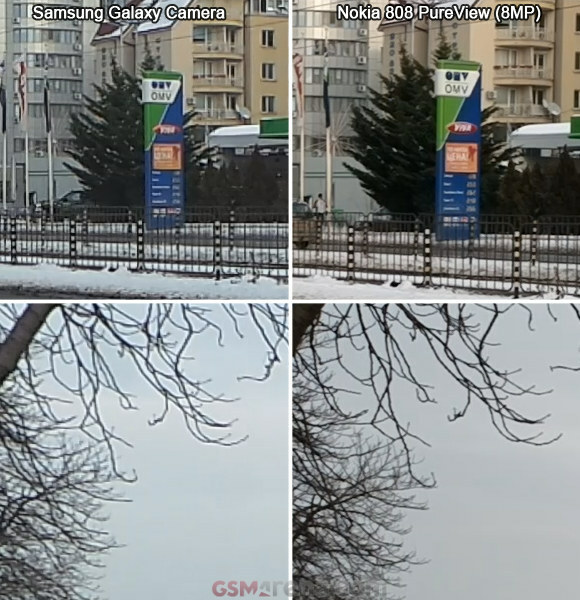 The Galaxy Camera has its video stabilization to rely on, which should help (it helps on the Nokia Lumia 920), so we shot these samples from the hand. The videos from the Samsung Galaxy Camera look lighter, but again they have less detail than those shot with the 808 PureView. The big sensor along with super sampling manage the keep the image virtually noise-free. Switching the video light on improves things further, mostly in terms color rendering.